For adult cats (1-7 years old) with a dull coat, dandruff and/or sensitive skin. Hair & Skin Care is precisely formulated to help support a healthy skin and coat. COMPOSITION: dehydrated poultry protein, animal fats, vegetable protein isolate*, rice, vegetable fibres, maize, hydrolysed animal proteins, wheat, yeasts, maize flour, maize gluten, beet pulp, soya oil, fish oil, minerals, borage oil, marigold extract (source of lutein). ADDITIVES (per kg): Nutritional additives: Vitamin A: 25200 IU, Vitamin D3: 700 IU, E1 (Iron): 48 mg, E2 (Iodine): 4.8 mg, E4 (Copper): 15 mg, E5 (Manganese): 62 mg, E6 (Zinc): 187 mg, E8 (Selenium): 0.08 mg - Preservatives - Antioxidants. ANALYTICAL CONSTITUENTS: Protein: 33% - Fat content: 22% - Crude ash: 6.7% - Crude fibres: 5% - Per kg: Omega 3: 11.2 g - Omega 6: 52.8 g. *L.I.P. : Protein selected for its very high assimilation. My girl loves this product, Her coat is super soft and silky, I just love stroking her coat, its so beautiful to touch. 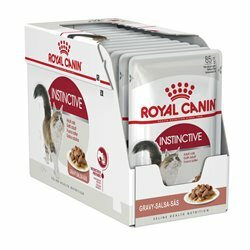 my cat loves this brand of dry food. Although not the cheapest around it definately improved her coat as promised.